It’s pretty great that selling online isn’t just for big businesses anymore. Whether you’re a small outfit or a one man army, there are sites that perfectly suit your selling needs. And while you’re decidedly not a big multi-national, the impression your business gives still counts for a lot. Anything you sell has got to look good, travel well and keep your customers happy. Let’s take a look at some tips about packing items for eBay. You need a dedicated space to pack parcels—not the floor and not the kitchen counter. A small table free of clutter is ideal. It’ll give you room, spare you stress, and save your legs and back. Buy a tape gun, tape measure and postal scale. If you’re seriously organized, grab a utility belt and stash it full of scissors, markers and more. It’s so easy to use more material than you need. Try and use just enough to protect your items and fill the box. You’ll use less packaging and keep the box lighter, saving you money on materials and shipping. Before you even list your item, figure out your shipping costs. Pack it up, measure the box and weigh it on your postal scale. Round the weight up to the nearest quarter, half or whole number, then look up the shipping cost online. This saves you from undercharging for shipping, which can really add up over time. Remember: postal companies ship by dimensional weight—box measurements plus box weight. It’s unlikely that every item you sell is the same size. That’s why multi-depth boxes are a smart choice for shipping things. One multi-depth box allows you up to three different box heights, so you can safely ship a heavy book one day and a desktop statue the next. They cost a little bit more per box, but they’ll save you time on storage, packing supplies and shipping costs. Use bubble mailers if you don’t need the space of a box. They’re perfect for flat-packed items. Courier bags are great for clothing and jewelry; they’re puncture-, tear- and tamper-resistant. You’ll save on shipping charges, too! Cut lengthwise slits into pool noodles and wrap them around your items. Since they’re foam, they work great as padding and fill—and they’re colorful, too! Empty egg cartons do the trick as well. Stack them on the bottom of the box, drop in your item and fill up the sides. Waterproof things as much as you can because boxes change hands outdoors—even when it’s raining. Use plastic bags, pouches and even handheld stretch wrap if you really want to be sure. Reinforce the bottom of the box. Use quality tape and press it down tight along the seams. Two layers are even better if you’re worried about keeping it closed. Don’t overstuff mailers. They’re well-built and padded but can still burst. “If it fits it ships” is true, but it’s easier for items to be damaged that way. Present your items in the best way possible. Arrange packing paper so it unfolds to reveal a book face-up. Nest a vintage watch in some old newspaper (but test it first, in case it smudges!). Use tissue paper that compliments or matches the color of the item. Think about including a thank you note, business card, coupon or bonus gift of some kind. A great unboxing experience will net you great reviews and even greater sales. Using eBay and other online auction sites is a great way to sell your products, or get rid of unwanted but valuable items. 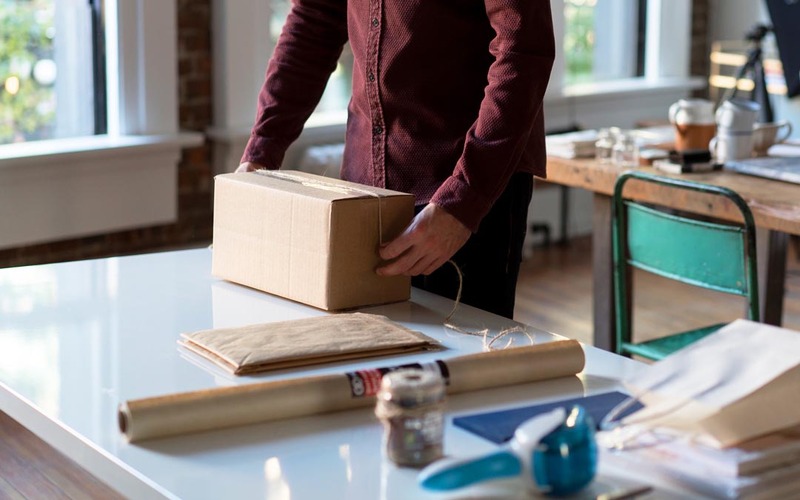 With these packing tips from The Packaging Company, we know you’ll enjoy successful sales for years to come. Be sure to check out our selection of packaging materials for all your packing up needs.